Burapha University originated from Bangsaen Educational College which was the first regional tertiary educational institute, established on July 8, 1955. Subsequently, it became a campus of Srinakharinwirot University and was renamed Srinakharinwirot Univeristy, Bangsaen Campus on June 29, 1974. 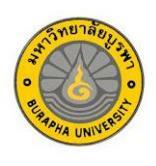 On July 29, 1990, it was again renamed Burapha University and later became autonomous on January 9, 2008. In 1949, the High-Level Teacher Training School at Soi Prasarnmit, Prakanong District, Pranakorn Province was established by The Ministry of Education. After that, in 1954, the school was upgraded to be an educational college and renamed Prasarnmit Educational College. In 1955, two campuses were established: Pratumwan Educational College in Pranakorn Province and Bangsaen Educational College in Chon Buri Province. On July 8, 1955, Mr. Mangkorn Promyotee, the Minister of Education at that time chaired the opening ceremony and placed the foundation stone of the administration building which was the first building of Bangsaen Educational College. There were 41 first generation students. In 1956 the college received Piboonbampen School from the Division of General Education to be a demonstration school of the college and renamed it “Piboonbampen” Demonstration School, Bangsaen Educational College. Later, in 1958, the first 35 students graduated from the school. According to Srinakharinwirot Act, Bangsaen Educational College was transformed to become a campus of Srinakharinwirot University and the supervision, which had been of The Ministry of Education, was changed to be under The Ministry of University Affairs. In 1988, the cabinet was agreed to transform its status to become a new university and on July 29, 1990, it was renamed Burapha University according to Burapha University Act 2533 B.E. in government gazette volume 107 section 131. Nowadays, Burapha University has become autonomous under government supervision in which its status is juristic according to Burapha University Act 2550 B.E. in government gazette volume 125 section 5 A, dated January 9, 1998 and effective from January 10, 1998. Generate intellectual knowledge and management practices to enhance social development. Provide world-class standard education in order to produce ethically minded, specialized, and potential graduates. Provide academic services to the society in order to establish it an intellectual richness and self reliant society. Support and maintain Thai arts, culture and Thai identity. Enhance strengths of the University through the establishment of highly effective management system making it independent and self-sufficient.